A tragic wreck was reported this morning. A big-rig is alleged to have run a red light and struck multiple vehicles. The truck rolled over due to the force of the impact. Two people died in the crash and 6 to 8 others were being evaluated for various injuries. As of this morning southbound Highway 135 is still closed. The driver of the big-rig was arrested for driving under the influence of drugs and/or alcohol. In reviewing photos graphs of the wreckage it appears that the truck was a Sysco truck. Sysco is a large food distribution company. Sysco Central California is based in Modesto, Ca. and reports having 104 drivers covering 2,818,652 miles per year in 2018. The Federal Motor Carrier Safety Regulations are very strict concerning a driver’s behavior. The limit for the presence of alcohol in the system is lower than a standard passenger vehicle. According to FMRS § 392.5, a driver cannot have more than a 0.04% blood alcohol level in his system while driving a commercial motor vehicle. This is one-half of the limit for the driver of a passenger vehicle. Drugs are even a bigger problem with big-rig drivers. Of course, there are some drivers who use illicit drugs simply for the high. However, there is a huge problem with big-rig drivers using stimulants to keep them awake on long drives. A driver arrested for alcohol or drug use so early in the morning lends one to believe that this is a stimulant drug case. Amphetamines and cocaine may help drivers stay awake, but these drugs can cause vertigo, agitation, hallucinations and change perceptions and reactions, which are critical areas for a truck driver. Whenever a truck driver is involved in a wreck there are several factors that must be immediately evaluated. First, a driver must be tested immediately after a wreck for alcohol or drugs, even if he is not suspected of being under the influence. Here, clearly, the police have suspicion so the driver has already been tested. 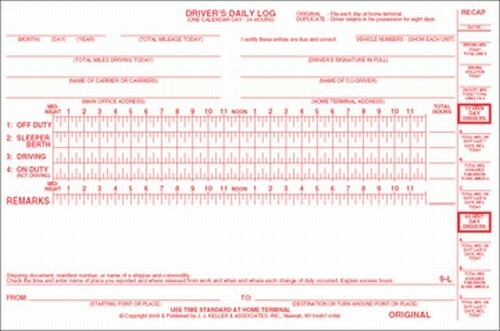 Secondly, it is important to examine the log books of the driver. A big-rig driver must keep very careful records detailing every minute of his day. The driver must note whether he is Driving, Off-Duty, On Duty Not Driving or Sleeper Birth. A driver has a limited number of hours that he can be on duty and an even more limited time that he can drive in a defined period of time. Typically a driver cannot be On Duty for more than 60 hours in 7 days, or 80 hours in 8 days. In any given 24-hour period a driver cannot drive more than 11-hours. After driving 11 hours the driver must be Off-Duty before restarting his driving time. 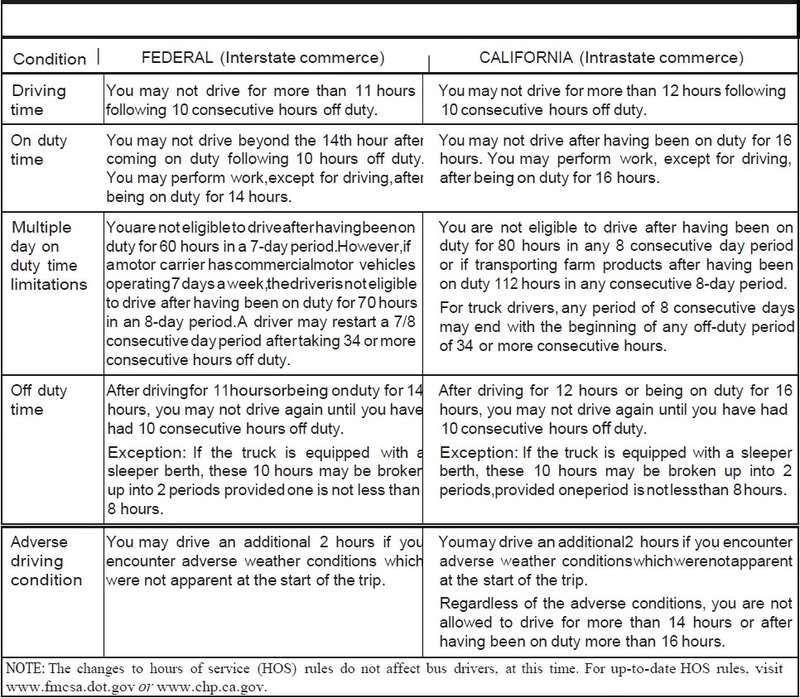 A driver’s record of duty status, in duplicate, must be kept by each driver and each co-driver while driving, on duty but not driving, or resting in a sleeper berth. The record of duty status must be presented for inspection immedilltely upon request by any authorized CHP employee, any regularly employed and salaried police officer, or deputy sheriff. There may be instances when you do not need to maintain a record of duty status. Every driver involved in a collision which results in death, injury, or property damage over $750 must report the collision on a Report of Traffic Accident Occurring in California (SR 1) to DMY. The report forms are available at www.dmv. ca.gov, or by calling 1-800-777-0133, or at CHP and DMV offices. You (or your authorized representative) must submit the report within 10 days of the collision whether you caused the collision or not and even if the collision occurred on private property. This form is required in addition to any other report made to or by the police, CHP, or your insurance company if the collision resulted in any damage over $750 and/or an injury or death. If you do not report the collision to DMY, your driving privilege will be suspended. NoTE:CDLholders may downgrade to a noncom­ mercial license during any mandatory suspension period to be eligible to obtain a restricted license. All tests and fees will be required to upgrade when eligible. Failure to keep logbooks, or driving over hours is a separate theory of liability against a truck driver. The next question that must be answered when evaluating a trucking case is the role of an employer. Some drivers run as “Owner-Operators”, which means they own and maintain their own trucks, while others work for trucking companies. Either way, the trucking company has obligations to ensure the driver is fit to drive. The driver must be properly trained. The drive must pass random drug tests. The company must have a system in place to review and maintain custody of log books for at least 6-months. Finally, it is important to determine the amount of insurance coverage available. The FMCSR mandate that a big-rig carry at least $1,000,000 in coverage, but many companies carry more. It is also important to determine if the trailer was separately owned and played some role in the wreck. It is even possible under some circumstances to obtain coverage from the shipper. If you have been injured, or a loved one has been killed in a big-rig crash it is important to get your attorney involved right away. The insurance companies for the trucking company have “rapid response teams”, which consist of lawyers and investigators who respond to crash scene within hours. At Ernst Law Group our lawyers are highly skilled and experienced in handling trucking cases in Santa Maria, San Luis Obispo, and throughout the state. We are available for a no cost, no-obligation consultation when you call us at (805) 541-300. Choosing the right lawyer is key. Be sure you feel comfortable with your lawyer and that you are not pressured. Be wary of lawyers who contact you without your consent, often times with glossy presentations about their firm. At Ernst Law Group we believe that a client should evaluate his or her own situation without pressure or questionable direct solicitation. The names of the two men killed in this tragic wreck have been identified as Rick Motley, age 60, and Jesse Gluyas, age 24. Both men worked for VTC Enterprises. 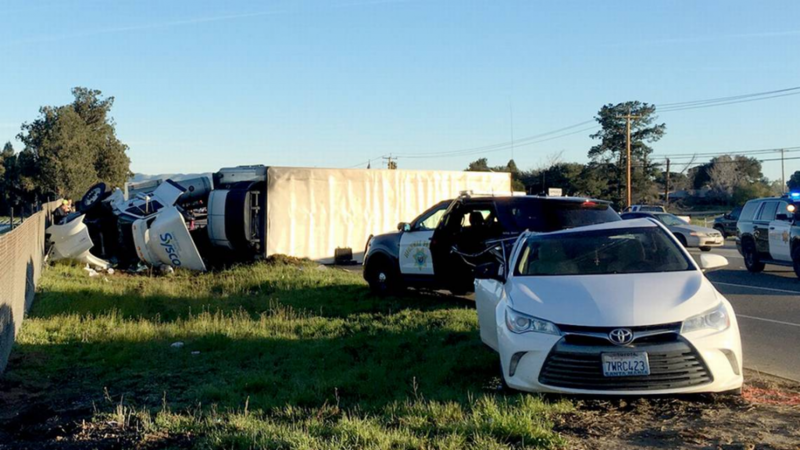 The CHP has identified the driver of the big-rig involved in this morning’s fatal crash on Union Valley Parkway in Orcutt. The driver is allegedly 56 year old Gilbert Pena of Santa Maria. The 8 injured people are reportedly all from the Santa Maria area. PreviousPrevious post:Everything You Need to Know about Semi Truck Accidents in CaliforniaNextNext post:What Kinds of Damages Can I Recover After a Car Accident?